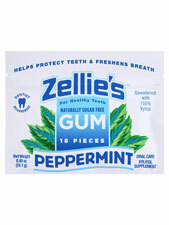 Enjoy all-natural Zellie's throughout the day for fresher breath and healthier teeth and gums. Warnings: Please keep Zellie's gum away from pets. Xylitol is not recommended for animals. Additional Info: Vegan. Dentist recommended. Zellie's gum is produced in a facility that also processes Soy. Suggested Use: Chew Zellie's gum directly after meals, snacks, and drinks.